Burton ASC is a small but flourishing club with a membership of 250 and a strong team of volunteers at its heart. But things have not always been so good as Keely Downend discovered. When Simon Ward and Ian Gates offered to boost Burton ASC’s dwindling membership, little did they know the gesture would lead them to playing a leading role in the club. In 2009, the club lost use of its pool when it closed for refurbishment for 12 months. Members had to travel further, which led to reduced numbers and finances, the committee was ever changing and the coaching team had reduced to one paid head coach and very few trained volunteers. That’s when Simon and Ian decided to join the swim section for a monthly fee. They had not swum for 34 years, let alone organised a swim session. But what happened next took them on an incredible two-year journey from poolside helpers to joint head coaches. They started 2013 as balcony parents, moving to poolside due to a lack of helpers. This led to a lifeguarding qualification as well as Level 1 and 2 teaching certificates. It was at this point that Ian and Simon decided to introduce the Swim England Learn to Swim Framework and the club now follows stages 4-10. The club was still struggling financially and could no longer afford to pay a head coach. The start of 2015 saw Simon and Ian take over as joint head coaches, having taken Level 1 and 2 coaching qualifications along with CPDs to aid the progression. It was during a coaches’ conference in 2014 that Simon and Ian met Fred Furniss, who was Swim England national talent officer, and began a rewarding friendship. “Fred offered to attend the club and supported us in doing a yearly plan,” explained Ian. “He spent hours with us talking through each one individually. He offered to speak to the whole club, including parents, as he believed it was key to engage with all involved, not just the swimmers. He then followed up with a training session for our older swimmers where he cemented the coaching which we had been delivering from his advice. By offering support, talks and leading sessions, Fred had become the club’s unofficial mentor. Becoming their official Swim England mentor last year was something both Ian and Simon were so happy with, viewing it as a great opportunity for the club to progress. Fred sadly passed away on 9 July last year but his legacy will remain. “The club will be naming an annually awarded trophy after Fred,” said Simon. “This will be on technique criteria as this was his ethos. Fred is a huge loss to the swimming world and our club. At the start of 2014, the club had not won a gala, either of a league or a friendly nature, for more than five years. But the wait ended that year with a victory in the second-tier final of the Winter League Division 2. The club has gone on to win 35 galas, gain promotion to Winter League Division 1, make various Autumn League and Diddy League grand finals and become competitive once again in the Staffs League. They have gone from being third-placed locally as a club to winning the annual inter town gala for the last four years. In 2017, the team won the East Staffordshire team of the year crown with Simon and Ian named coach of the year. Both coaches have also been selected as regional age group skill coaches. 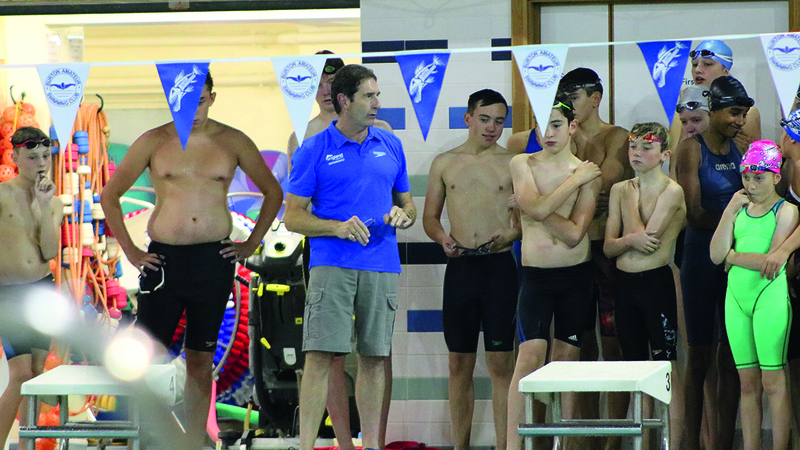 Simon and Ian’s philosophy is to see every swimmer maximise their potential in swimming, develop as a person, have fun swimming and to be the very best they can. With this in mind, the club funded eight senior swimmers to become qualified swimming teachers and with Duke of Edinburgh participants and scouts all supporting the coaching programme, everyone involved is given the opportunity to fulfil their personal aspirations. Karen Cooper, whose daughter Ella, 12, has been at the club for almost four years is pleased with her daughter’s progress under the guidance of all the club’s coaches. She said: “The coaches have taken Ella through from stage 7 to seniors and all the coaches have helped her on her journey. Phil’s daughter, Bella, is almost 10 and has been a member since she was eight. “Bella’s swimming has progressed under Simon and Ian’s training and they always make it fun,” he said. “I would recommend Burton ASC to any parents who are attempting to find a suitable swimming club for their child. The club work tirelessly with the resources they have to provide the best possible outcome for their members. Gaining Swim England’s Swim Mark shows their commitment to provide top quality participant experiences, whilst working to grow membership, develop volunteers and remain sustainable. Has your club got a story to tell? If so, please contact communications@swimming.org with the details.